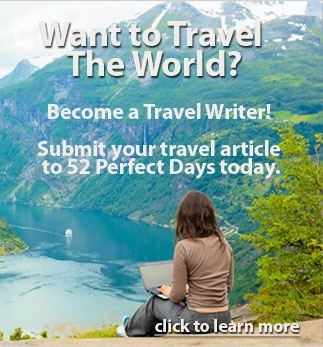 Do you know Peru? 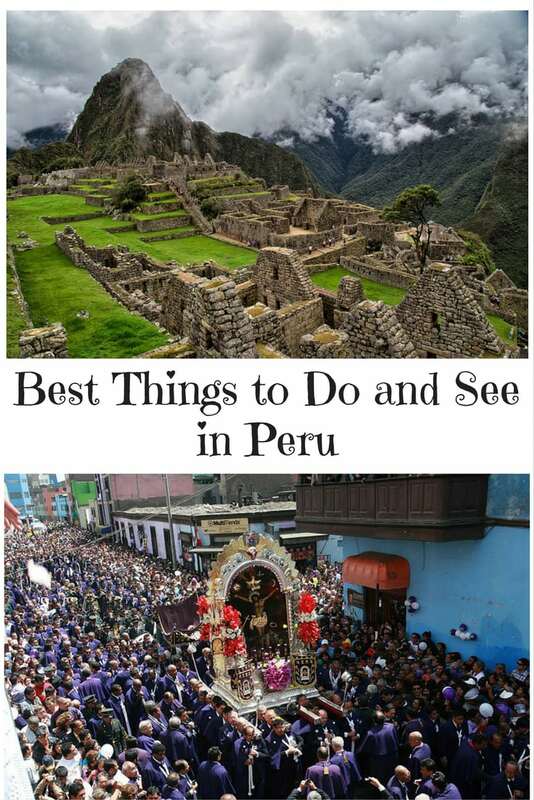 Would you like to know the best things to do and see in Peru? From the mysterious Machu Picchu to the huge Amazonian forest, Peru is a country full of treasures and secrets. Follow us at the luxury travel agency Argentina Excepcion to discover this intriguing part of the world. 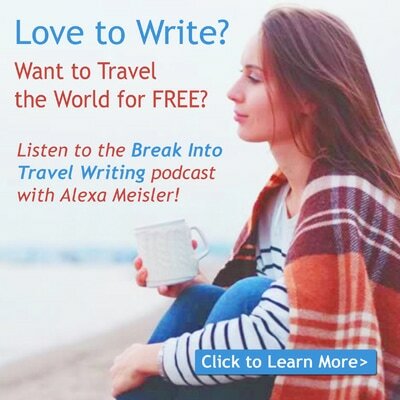 So, why travel to Peru? 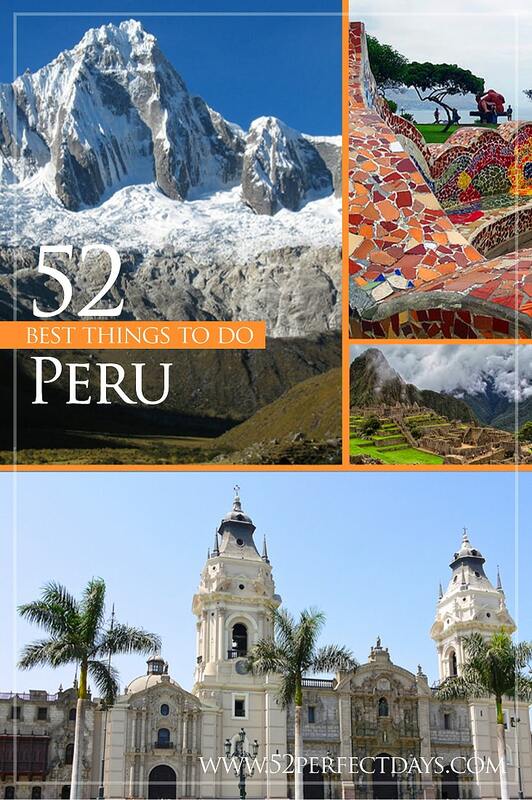 We have a 52 reasons you should travel to Peru! 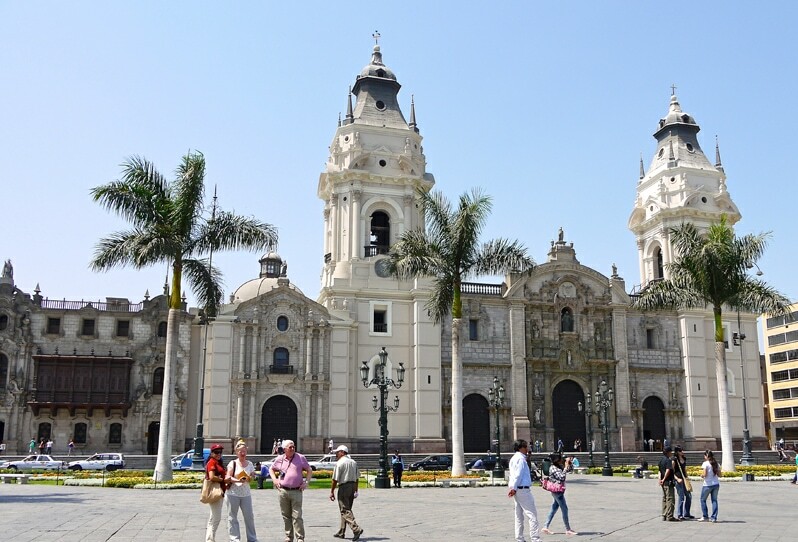 Go to the plaza de Armas in the historic centre of Lima and visit this place full of culture and history! At 12:00 am, don’t miss the changing of the guard in front of the Presidential Palace! Take a photo in front of the Cathedral and the imposing hotels of the place. 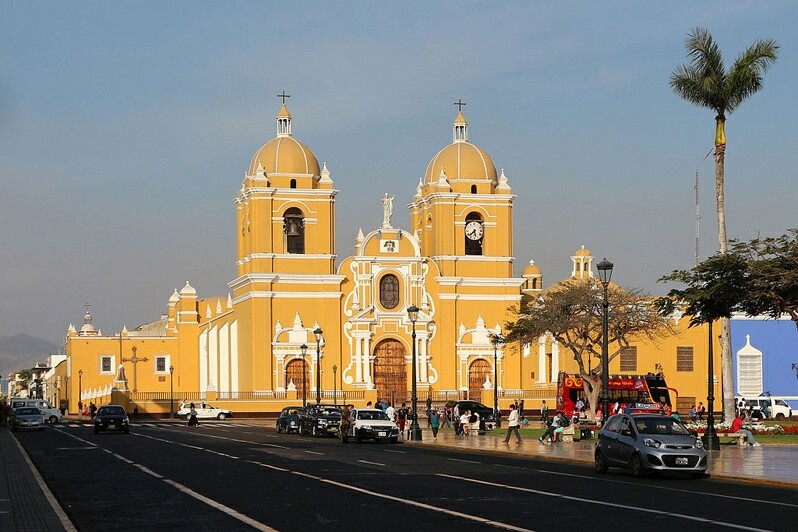 Visit the many churches of the centre: from the Cathedral of Lima and it’s religious art museum to the Santo Domingo church which contains San Martin de Porres and Santa Rosa de Lima relics. Moreover, in San Francisco church you can visit the very secret catacombs. Enter the Literature house in the centre of Lima. Discover the most important Peruvian authors, from José Maria Arguedas, defender of the Indian and Quechua traditions to the famous Mario Vargas Llosa, the winner of the Nobel Prize 2010. Try to learn Los Heraldos Negros from Cesar Vallejo, one of the most important poets of Latin America. Eat the delicious Peruvian gastronomy in one of the restaurants of the centre like the Tanta for example. Taste the cuy (Guinea Pig), the lomo saltado or the ají de gallina! Delightful for the taste buds! Walk in the borough of Miraflores in Lima, cross the beautiful Villena Bridge and enjoy the view! 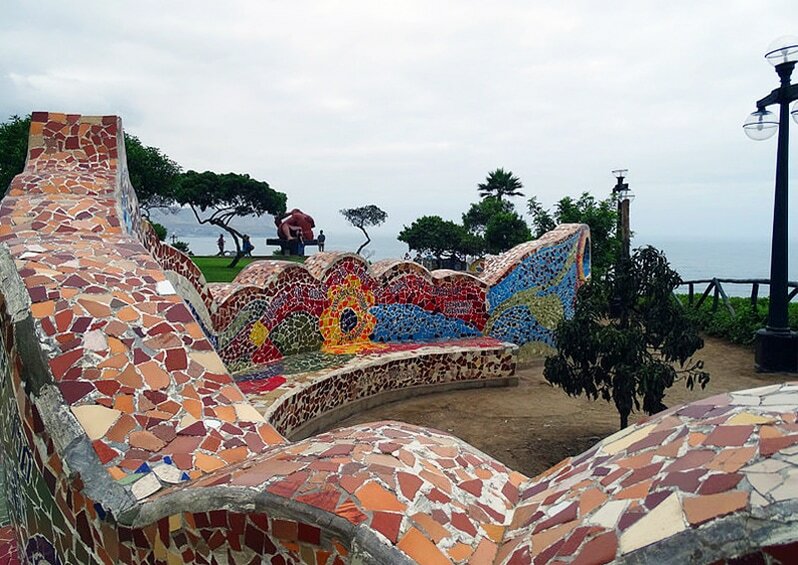 For lovers, the Amor Park is perfect to have a peaceful walk to reach the huge sculpture El Beso from Victor Delfin. If you want to go shopping, the Larcomar is one of the most important shopping centres in the capital. Celebrate the night in Miraflores! Go to the Huaringas Bar to listen to a live concert or drink some cocktails with pisco! Or Both! The Bizarro Bar is also a must-see for those who love non-stop dance party! There you’ll listen to music from the 80’s! Let’s dance! 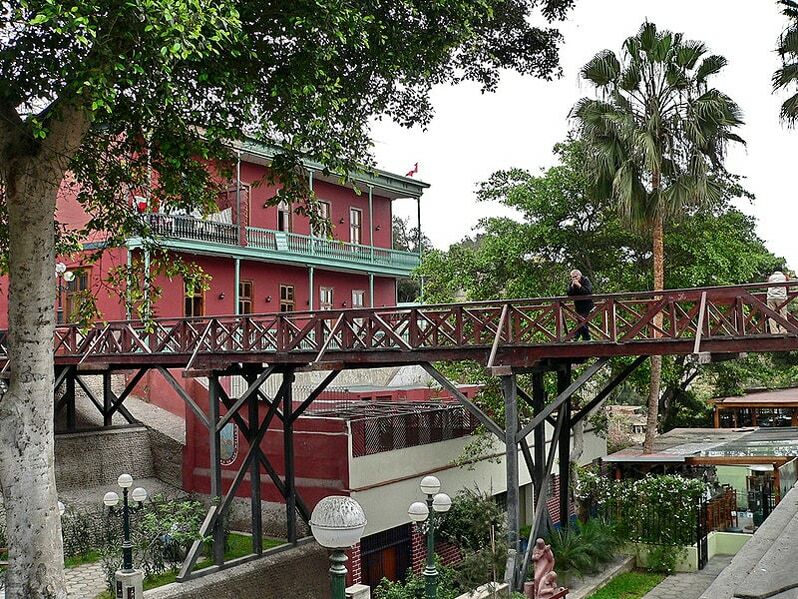 Admire the Bridge of Sights in Barranco! Barranco is the bohemian and romantic district of Lima. It’s situated on a cliff near the ocean. It’s both a good place to walk and to go out at night. Many intellectuals live there. Take a combi (the local bus) in Lima and discover how crazy the traffic is in Lima streets! Try to guess what bus you have to take and where your bus stop is… Get gouged by the bus controller. Finally make the choice to take a taxi because it’s safer. Eat a ceviche in Barranco in Canta Rana or in La Trastienda, two typical seafood restaurants in Barranco. The ceviche is one of the most famous food of Peru: it’s raw fish marinated in lemon. It’s exceptional! Observe the boat in the Callao harbour. Enjoy numerous beaches (La Punta) and the fortress of King Philip built in 1747 to defend the city against pirates. From Callao harbour, you can sail to the Palmino Island to see many sea lions. Discover San Isidro district: walk into the olive grove with its 1,500 olive trees. The archaeological site of Huaca Huallamarca worth a visit! It’s very impressive to see this huge historic sit in the heart of the city! Have a cultural moment seeing the paintings of the Mali, the art museum of Lima. Discover this impressive building from the architectural eclecticism of Lima. There, enjoy the pieces of art from the numerous artistic currents from the colonial artists to the modern Peruvian. One of the Best Things to Do and See in Peru is participating in the Lord of miracles procession on the 18th and 19th of October in Lima. In the city centre of Lima, you can take part of one of the most impressive procession in the world. This painting was created by a slave in the XVIIth century and survived at the huge earthquake which occurred in Lima and Callao in 1655. It has been a symbol for Peruvian people and an object for veneration since this date. 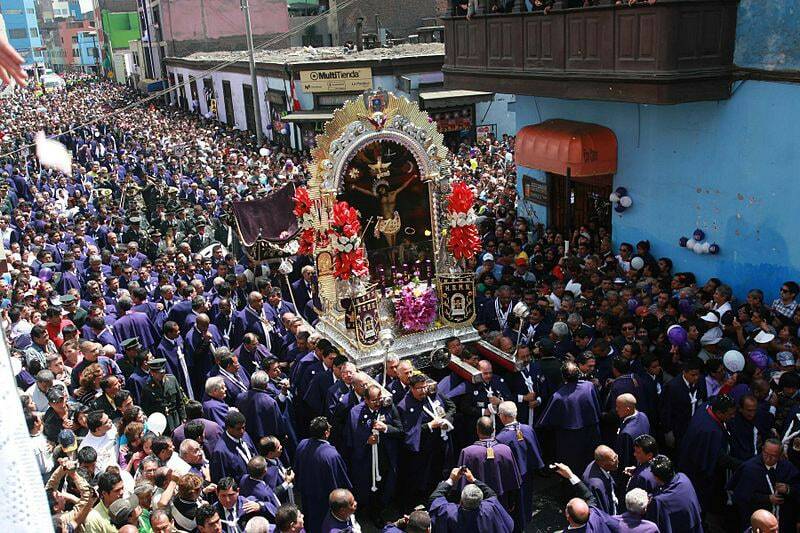 Each year, a huge procession with people dressed in purple colour takes place in Lima and is worth a look! Visit the San Cristobal watchtower. Reach the cross at the top of the hill and enjoy the 360-degree view. Be careful at night, because the place may be a little dangerous. Rest on the beaches near Barranco on Miraflores! In summer, you’ll be able to sunbathe on the warm beaches. If you’re an adventurer, you can try to swim, but the Pacific Ocean is really cold! Good luck! If you leave the city, you can go to Pachamac, a small town at 31 km from Lima. It’s the most important archaeological location near Lima. It was a ceremonial and religious centre for the Lima culture in the year 400. It was transformed by the Incas into a real syncretism between many different cultures. 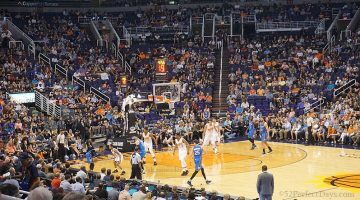 It’s really interesting for those who like history! Go to the harbour of Pucusana. It’s a quiet typical fishing port located one hour from Lima. If you are looking for beaches, calm and peace, this place is made for you. You might be the only tourist in this isolated part of Peru. Enter the Nor Yovos Caucho reserve and the beautiful Cañete River Basin with its turquoise lakes. You may catch the trout and observe the birds. There are also many archaeological ruins like pre-Columbian terraces and a part of the Inca Trail from Pachacamac to Jauja. The Paracas reserve is the most important protected landscape area in Peru. It protects the sea coasts wildlife of this region. Indeed, here there are 216 birds’ species and 186 fish species on the beaches. You may take this opportunity to visit the ruins of Paracas which are not too far away. Do you like sandboarding? You’ll adore Ica and its desert which is a paradise for those who are looking for extreme sensations. 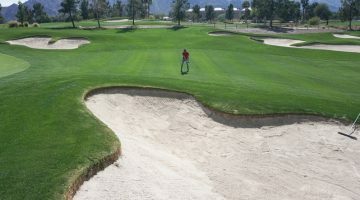 This beautiful site is famous for its quad excursion and sandboarding areas. 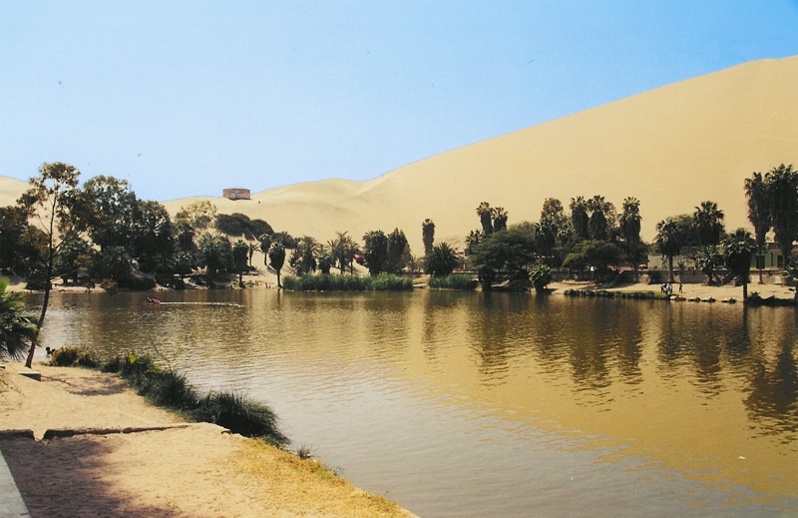 Moreover, the numerous green oases like the Huacachina lagoons with palm plantations give to this place an exotic taste! Drink Pisco in Pisco! You’ll find in this Paracas historic centre many vineyards to make this alcohol which is similar to the cognac. Some people say that Pisco is Chilean but this city is a proof that Pisco is Peruvian alcohol! Today, it’s still a controversy. Drive to Nasca and go up to one of the watchtowers to have a big viewpoint and observe the Lines of Nasca. 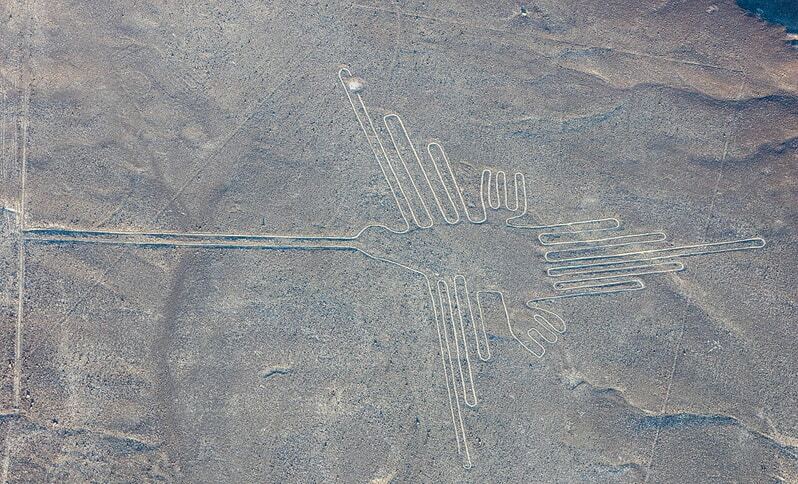 This mysterious forms of dogs, monkeys or birds come from the Nasca civilisation (300 BC). Try to unlock the mysteries of this very technical people. Indeed, the Nasca created a system of aqueducts which was really sophisticated. Climb the Cerro Blanco, the highest dune of the continent! It is 2,078 meters above sea level. It is one of the most famous places to do sandboarding! 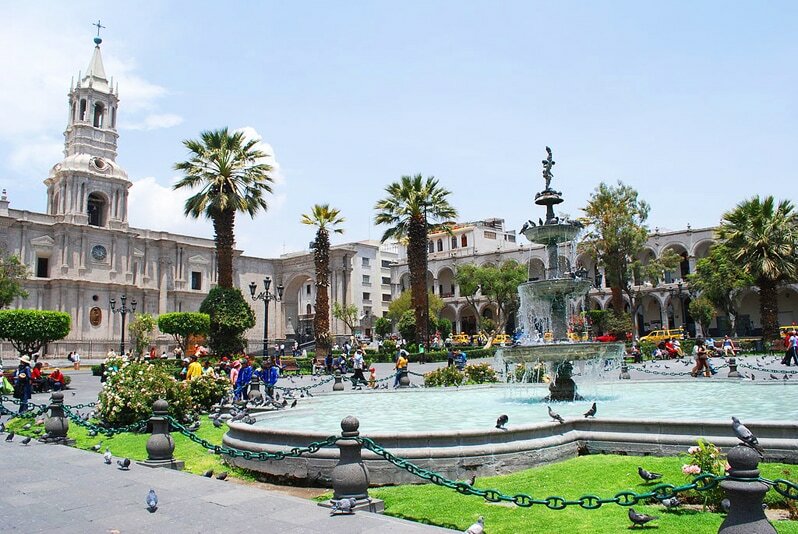 Welcome to the white city Arequipa, the second most important city of the country! Visit the many churches like the Cathedral, Santo Domingo, San Francisco or La Merced church. All these monuments are built with white stones extracted from the Misti volcano which is still an active volcano. This city enables you to enjoy canyons and volcanoes in beautiful desert landscapes. Enter into the Colca Canyon near Arequipa. It’s the fourth deepest canyon of the world with 3,400 meters in depth. There, you’ll meet many mountains and volcanoes, from the Patapampa Pass (4,910 meters high) to Ubinas, Chachani, Ampato and Sabancaya Volcanoes. The Ocolli amphitheatre and its pre-columbian terraces are worth a visit too. The desert arid landscapes provide you an astonishing sight. Sail on the Titicaca Lake, the highest navigable lake on the world. Discover the Uros floating islands made with reeds. There, 2,500 Aymaras Indians live in an old traditional lifestyle. Try to learn their ancestral fishing methods and artisanal know-how. Stop at the Sillustani necropolis on a peninsula on the Umayo Lake and look at this spectacular view on the cliffs. Discover the chullpas, these funeral towers where the Aymaras, the Collas and the Incas dignitaries themselves were buried. This fascinating place is a must-see as the sun is rising. Go to Puno, the city of the Titicaca Lake. It contains many architectural jewels like the monuments in the city centre places like the cathedral: built in the mestizo art which is a syncretism of Jesuit, Aymaras and Quechua art. Pass through the majestic Deustua Arch and climb all 620 steps of the Kuntur Wasi watchtower built to celebrate the condor king. The view over the lake offers you breathtaking scenery. Try to distinguish the llama, the alpaca and the vicuña. Take a selfie with a llama. And realise that all the llamas don’t spit. Post it on Facebook. Laugh when your friends say that there is a family resemblance (true story)! 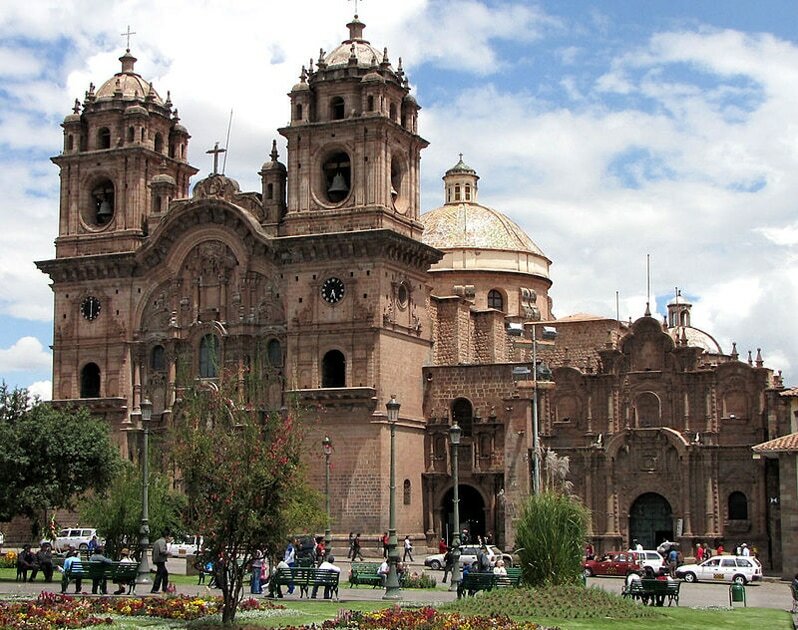 Visit Cusco, the principal gate to the sacred Valley, the cradle of the Incas Civilization. This syncretic city, full of history and legends is a showcase for those who want to discover a mix between Spanish colonial art and Incas art. For example, the Church of the Company of Jesus was built on the foundation of Amarucancha Incas palace. Try to negotiate with merchants at Mercado of Cusco. 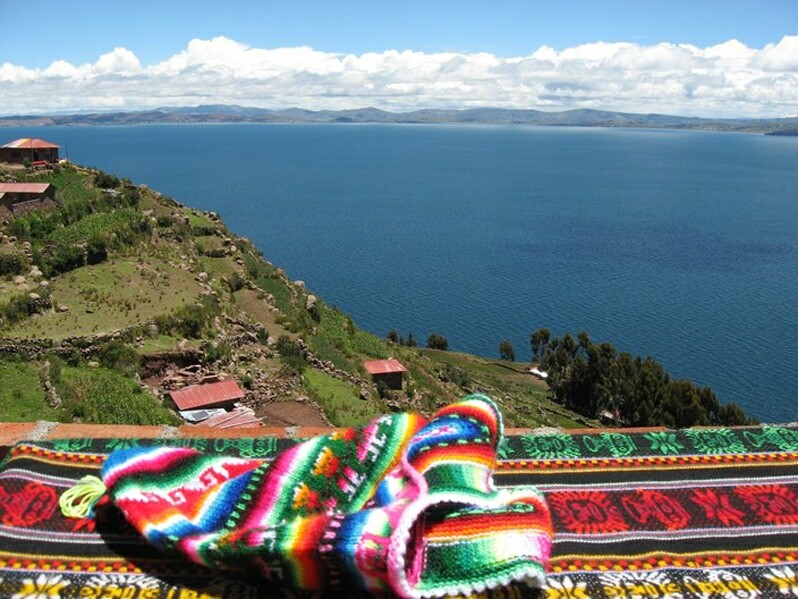 Buy typical panpipes, traditional embroideries or the famous Peruvian woolly hat! Wander on the Santa Ana neighbourhood and let yourself be guided by your senses through the back alleys of the city. Explore the ruins of Ollantaytambo in the Sacred Valley. Ollantaytambo was a fortress where there were many fierce fights between Incas and Spanish conquistadors. There, you’ll observe many terraces and the very famous Temple of the Sun where the Incas used to worship the Sun-God. Enter the Sacsayhuaman fortress and discover this wonderful architectural achievement. The stones were perfectly cut for this monument and were fit into each other with pin-point precision. Today, there is still a mystery about the methods the Incas used to bring these stones there while they didn’t even invent the wheel. 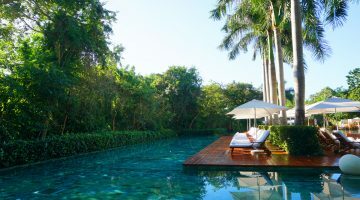 Moreover, this place is very peaceful and calm and you’ll appreciate this atmosphere. 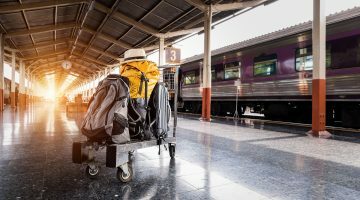 Take the train from Cusco to Aguas Calientes. It’s such a beautiful way in the Urubamba valley and it gives you an unforgettable experience in astonishing landscapes! Enjoy the panoramic view, observe the Pampa of Anta and follow the Urubamba River and its luxurious vegetation. Take a bath of 38 degrees in the thermal waters of Aguas Calientes. They are really famous for their medicinal virtues and you’ll be able to rest and to relax in the theatre of the Andes Mountains. Go to the market of Aguas Calientes and buy some souvenirs of Machu Picchu! 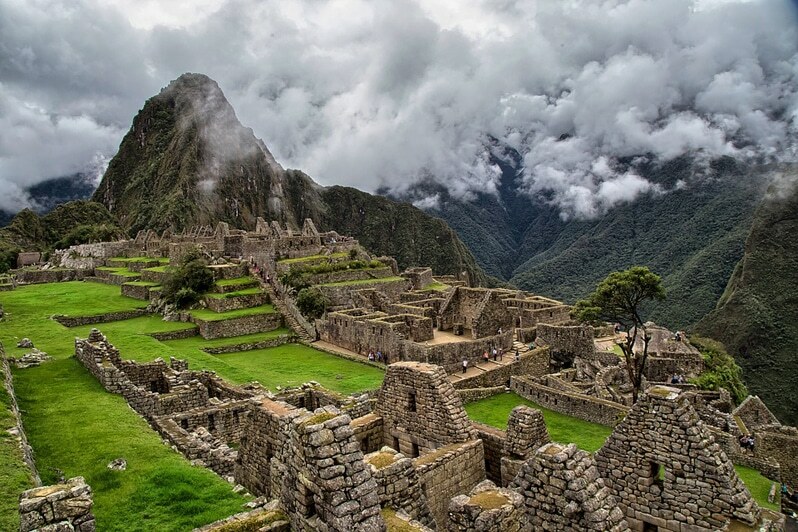 Take the Inca Trail and enter the legend! It’s a 25,000 km trail along the Andes Mountains built by the Incas which was used for the messengers of the empire. The last part which ends in Machu Picchu is a very practical 40 km road. See many Incas ruins and vestiges all the way. Visit Machu Picchu. Enter the mystery. Learn how to dance to typical Peruvian music: from the Huayno, the sierra dance to the African festejo, each dance has its own rhythm, instruments and identity. Dance the marinera norteña, a seductive parade which used to be danced with horses in the past. Located at 2,750 metres high, Cajamarca is very famous in the Incas history. Indeed, it’s the city where Atahualpa, the last Inca was captured by the conquistadores of Pizarro in 1532. This event precipitated the fall of the Inca Empire. There, you may visit many churches which remind us the Spanish presence in this region. Near the city, you’ll visit the milk farms which are a speciality of the region. Huaraz is the second most populated city in the country. This city is surrounded by the snowy summits of the White Cordillera. Go to the Rataquena watchtower and enjoy a beautiful view at the crossroad between the White and the Black Cordillera. 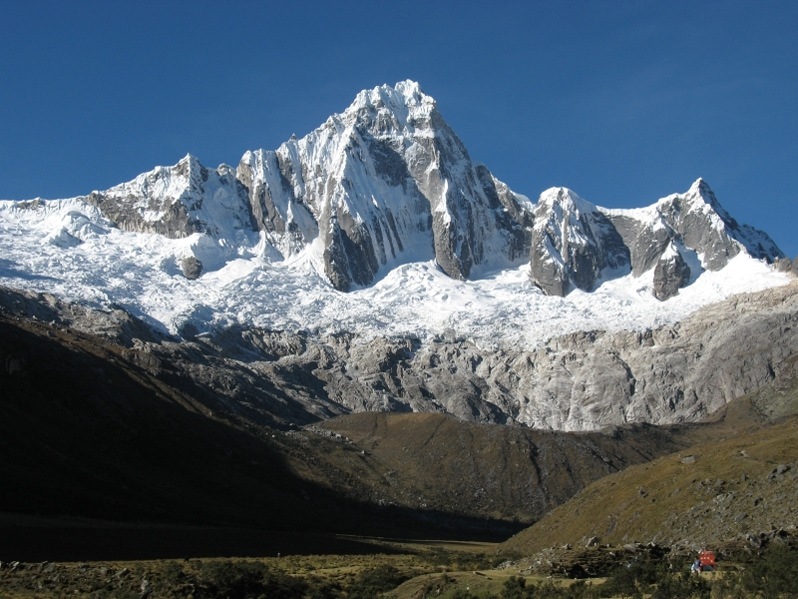 From Huascar, you can walk to the beautiful Huascaran Park and its marvellous mountains. Trek in the White Andes Mountains and the Huascaran Park. The Huscaran Park is part of the World Natural Heritage : admire the spectacular Callejon de Conchucos, climb up on the Huascaran or Huandoy summit, explore the impressive Quuilcayhaunca and Carhuascancha quebradas There, there are many beautiful landscapes to discover ! Discover Chachapoyas, this strange city at the northeast of Cajamarca which is located between both jungle and mountains. 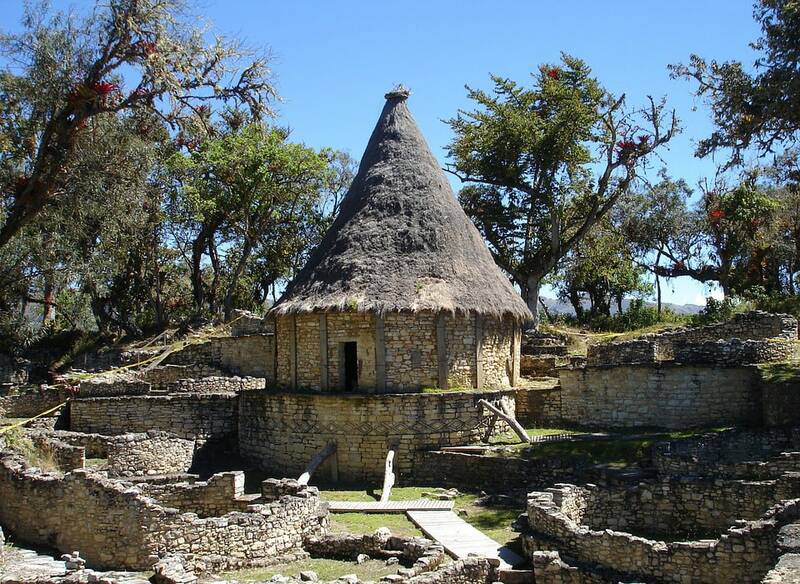 Go to the Gocta falls lost in the jungle or visit the ancient Chachapoyas Kuelap citadel to discover the old civilisation named the “people of clouds”. 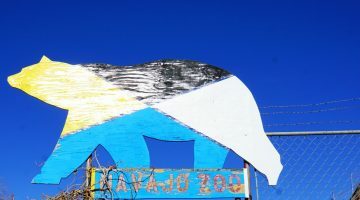 Go down to Puerto Maldonado and discover this city at the heart of the jungle. Enjoy a tropical climate and go on an excursion on the Rio Tambopata or go up on the watchtower to have an incredible view on the Amazonian forest. 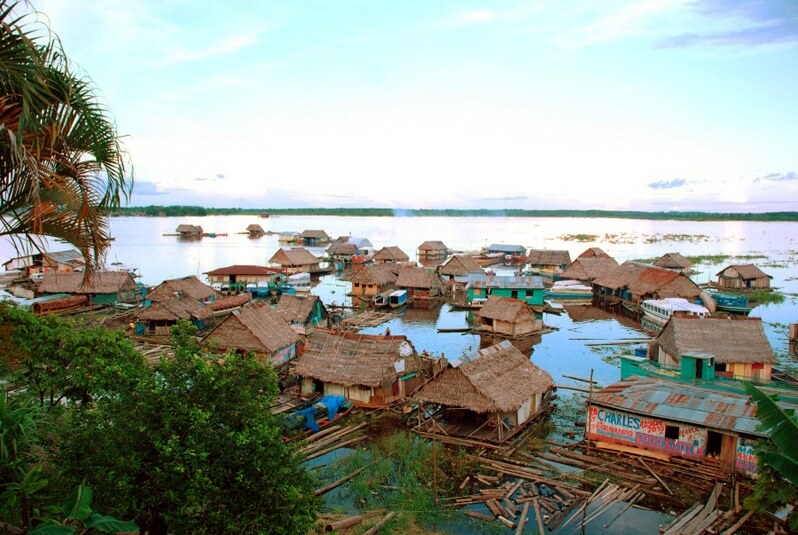 Go North to Iquitos, the Amazonian forest Gate and the last civilized place before mysteries and adventure… Sleep in the small lodges at the heart of the Amazonian forest. Enjoy your stay in this city with a real tropical atmosphere. Walk to the Casa de Fierro which was designed by Gustave Eiffel’s firm. It worth a visit! Enter the Amazonian forest. Discover luxurious vegetation and a lot of strange animals. From the pink dolphins of the Quistococha Lake to the marmosets of the Monkey’s Island, it’s a pleasant change of scenery! Climb up the Amazon River and look at the caimans! The Manu Park and the Tambopata reserve are huge natural reserves. Try to discover the primitive life near the Indian tribes in the heart of the Amazonian forest. 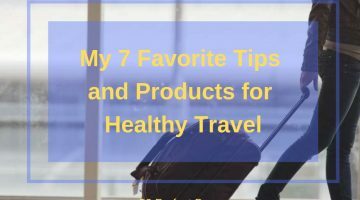 Find the best guide to approach these traditional lifestyles. Meet the chaman (the chief of the tribes) and live a spiritual experience drinking the famous ayahuasca, this strange potion made with creepers. Enjoy the white sand beaches of Mancora in the north littoral. Mancora is a wonderful fishermen city. It’s famous for the turquoise sea and for the big waves. It’s a paradise for surfers and for those who are looking for a calm and peaceful atmosphere without too many tourists. Welcome to the city of friendship: Chiclayo, the fourth most important city in the country. Don’t miss the cathedral which is designed by Gustave Eiffel and hides an impressive metallic structure. Visit the many pre-Columbian sites surrounding the city like the pyramids of the Sican culture for example. Be quiet! You are now entering the Manglares Tumbes sanctuary… It’s a protected area which is unique in the world. The whole ecosystem focuses on the mangroves. Sail with a kayak between swamps and observe the wildlife which is very diversified in this region: you’ll find 10 mammal species, 9 caiman species and 148 bird species. Trujillo is a fresh green oasis in the desert pampa. It’s the third city of the country and a cultural centre of Peru. Go to the Chan Chan site to discover the Chimu culture or just wander on the Plaza de Armas and observe the Liberty monument sculpted by the German Edmundo Moeller. Then, walk in the street and raise your head: the Spanish style of the multicolour houses is really impressive! Take part to the Qoyllur Rit’i pilgrimage. This incredible event occurs at the beginning of June and brings together more than 50,000 Peruvian people in the astonishing Andes Mountains near Cusco. It’s a real syncretism between Catholic worship and Indian traditions with traditional costumes and many colours! It’s an authentic experience! And finally, meet Peruvian people. Discover the real meaning of sense of hospitality. See really generous people who are very proud of their traditions and culture. Share a meal with a Peruvian and live one of the most convivial moments of your life! Peru looks amazing! So many wonderful things to see and do there. I hope to visit it one day! Thanks for this. It’s great to see so many points you wrote about Lima. A lot of people go to Peru and see nothing in Lima except for a huge dump of a city. But there’s a lot more to the place than that, and it’s worth staying in for at least a few days to get a feel of the place. 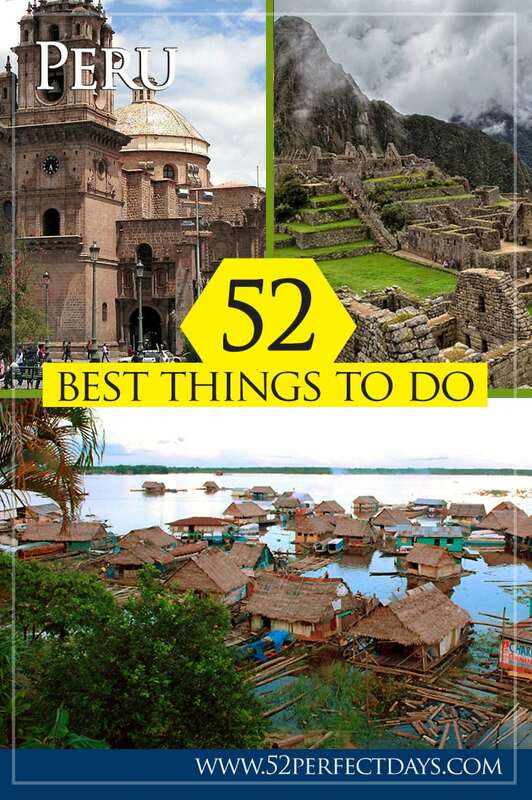 Most Peru articles tell you to head straight for Cusco and Machu Pichu, but yours doesn’t, which is great.